Kosovo’s PISA results remained in focus for the education sector throughout 2017, but it was the University of Prishtina that took center stage, as activists and academics focused on systemic issues plaguing the country’s oldest institution of higher education. It has been a year of criticism for the University of Prishtina, the biggest and oldest public university in Kosovo, with one report after another publishing concerning data about quality and integrity of the faculty and the university’s leadership. But though the year started with a small protest on the university’s 47th anniversary, overall, students have not come together in an organized fashion to demand a better education since 2014. Kosovo has nine public institutions of higher education and 21 private ones. Much of the attention from civil society and education experts is placed on the University of Prishtina since it serves the most students. According to the latest data from the Kosovo Agency of Statistics, published in July 2017, there are 39,719 active students at the university, but in reality, this number is unknown, according to Vice Rector for Quality Assurance Hysen Bytyqi. The university is currently working on a project to develop a reliable data collection center in order to better serve internal administration, policy making efforts, and tracking progress and shortcomings. Without more accurate and detailed data, a yearly review of Kosovo’s higher education–its successes, failures, and possibilities for improvement–mostly relies on data collected by civil society and insight from analysts. At the celebration ceremony for the University of Prishtina’s 47th anniversary, the student organization Study, Critique, Action, SKV, protested at the commemorative ceremony, with its members interrupting Rector Marjan Dema’s speech by shouting “You have ruined UP!” and “We’re the students, you’re the government!” Security ushered the students out and the rector resumed his speech. It was one of the few moves by students this to publicly protest alleged politicization at the university; in fact, student government is accused by students and critics of being passive and politicized itself. Civil society, through a coalition called The Coalition for Integrity and Transparency at the University, published six reports this autumn raising concerns about integrity and transparency at University of Prishtina, including a report by COHU that claims professors’ direct links to politics generates a system of unmerited academic advancements. Another report, published this year by ORCA, claims that a whopping 72 per cent or professors do not have the necessary number of publications in international journals to justify their academic ranking; the report further said that at least 28 per cent of professors have published in dubious or predatory journals. The claims mirror concerns raised by two European experts who wrote a report commissioned earlier this year by the Council of Europe and the European Commission titled “Strengthen integrity and combat corruption in higher education.” The report, which came after scandals involving unfair promotions and a civil society initiative to pressure the Ministry of Education to find a solution for better higher education in Kosovo, highlighted issues including unfair salaries, bribery and corruption, and political links in the academic staff. Meanwhile, in October, Enver Hasani was found guilty of fraud while serving as rector of the university. This year, our editor-in-chief chronicled the roots and propagation of plagiarism in Kosovo’s higher education. At both public and private universities, plagiarism is a pervasive problem amongst students, and is an ever-more systematic problem when professors themselves have translated texts into Albanian and claimed them as their own, and have even stolen students’ work. There is no record so show that any disciplinary measures have ever been taken against such actions. Experts and education managers agree that all universities should introduce plagiarism detection software, but University of Prishtina Rector Dama told Prishtina Insight that it would be impossible with the university’s small budget. What are students’ concerns? From our reporting on higher education, it is evident that all of the above-mentioned issues are on students’ minds, as well as other basic issues such as demands for better facilities and more access to books, more engaging student life and student clubs, and hoping that professors will actually show up to scheduled lectures. 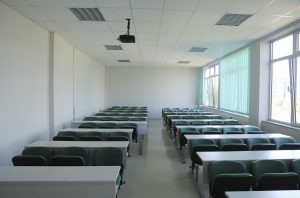 Education analysts emphasize that problems in higher education do not develop in a vacuum, but are connected to failures in the primary education system. At a debate this year at the EU Office, Arben Dermaku, Advisor to the Minister of Education, Science, and Technology, said that Kosovo’s results in the last PISA test show that the dire quality of pre-university education is feeding poorly-prepared students into Kosovo’s universities, who then graduate without proper training for the workforce. This year, our reporters covered a small school in the Municipality of Gjilan that can be seen as a microcosm encapsulating fundamental issues Kosovo faces when it comes to education: since the Kosovo War, Kosovo has struggled to create education, economic, and social welfare systems that can provide citizens with their basic needs. At the weathered and tiny Mulla Idriz Gjilani Primary School, where teachers hope for cutthroat education reform that will improve their students’ performance, an otherwise homeless family shares facilities with students. 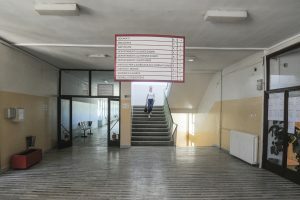 In September, our reporter also found that a discrepancy between the Kosovo Correctional Service and the Ministry of Education has left teenages who attempted to join terrorist organizations out of school; the two institutions responsible for providing education and diplomas in correctional facilities for minors disagree about who should issue high school transcripts. Prishtina Insight also covered gaps in school curriculum this year, finding that Kosovo’s history textbooks teach subjective and incomplete lessons on World War II. The history of Kosovo itself also varies depending on where textbooks are produced. 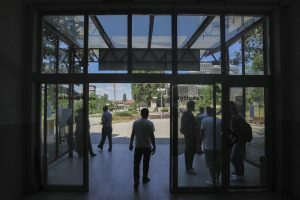 Divisions in Kosovo’s higher education system begin in the primary system. Serbian-language education has not been integrated into the Kosovo system, and is still provided by Serbia. “It’s two separate worlds; we are mapping the depth and spread of Serbian education system in Kosovo. It’s completely divided, it’s almost impossible to foresee integration of the system. So what we are aiming with our project is to form some form of cohabitation of the two systems… maybe further down the line, when Serbia and Kosovo are more stabilized and respect European values, maybe then they can work on substantive issues like teaching history,” he told Prishtina Insight. Zeqiri also emphasized that Serbs are not the only minority facing barriers to higher education; Bosniaks, Gorani, and some Roma students also speak variants of Slavic languages. He added that some Albanians and Albanian-speaking minorities are economically deprived and do not have a high school education. Albanian-speaking Muslim women who wear the hijab also face barriers and discrimination in the education system; one of our most-read articles this year covered this topic, and one of the interviewees said that she was actually discouraged by the Faculty of Medicine at the University of Prishtina to apply. What has the Kosovo government done this year to address problems in Kosovo’s education system? During the electoral campaign cycle for the June snap elections, MP candidates offered a plethora of solutions, from budget increases to a unified curriculum, paying teachers based on performance, and preventing government officials from holding faculty positions. The biggest education decision the Haradinaj government has made so far was to dismiss the entire board of the Kosovo Accreditation Agency. The Agency had recently suspended 131 university programs across Kosovo, a decision generally met with approval by civil society. The Prime Minister’s decision to dismiss the board two months later was met with concerns about transparency. The Prime Minister also recently said that the government is creating a commission to address Kosovo’s 2016 PISA results, and that next time around, some schools will first issue prep tests. In the realm of Kosovo’s justice system, one case has been especially prominent this year: that of the controversial Serbian Orthodox Church located on land previously part of the University of Prishtina’s campus. Construction on the unfinished church began in the 1990s under the Milosevic regime, and the university disputes the Orthodox Church’s land ownership of about four hectares, and the building’s legal basis. The university initiated proceedings against the church in 2012, but the case was thrown out on the first instance in 2015 when university representatives did not appear at the main hearing. The case was sent to the Appeals Court in March 2016, and in November, the Appeals Court rejected the university’s appeal. By the end of the month, the university submitted a new complaint, this time also filing a lawsuit against the Municipality of Prishtina for failing to nullify “discriminatory” legislation in favor of the church from the 1990s. Despite all of the criticism against Kosovo’s largest university, its current and historical importance to the country is undeniable. This was especially true in 2017, a commemorative both for the 25th anniversary of the parallel education system and the 20th anniversary of the historic 1997 student protests, marked by the university with a documentary and an academic conference dedicated to research on social movements in 1990s Kosovo. Although student organizers have hinted at collective organizing this year, especially related to the Orthodox Church case, the student Parliament lacks collective goals and purpose, for now.